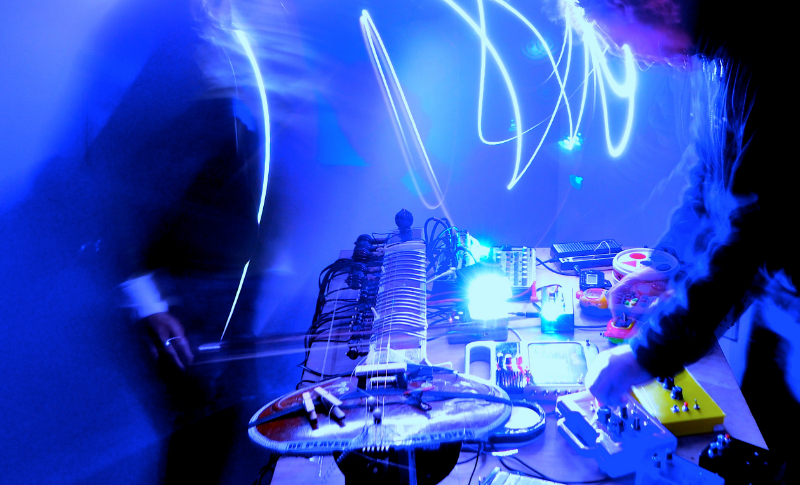 “Conspirators of Pleasure” (Poulomi Desai and Simon Underwood) will be joined by Lorah Pierre who creates her own musical and optikinetic instruments in a dynamic improvised performance. The OptoPhonic Workshop – a day of participatory workshops and exploratory performances combining film and sonic experiment and hands-on creative contagion for all. Also featuring workshops and performances by Adam Bohman, Sharon Gal, Heather Leigh, Lorah-Pierre, Rhodri-Davies, Murray-Royston-Ward, Blood-Stereo, Human-Heads, Mick-Beck, Luke-Poot, Blue Yodel and McWatt/Bettany. Part of the Tramlines Fringe Festival at Montgomery Theatre Studio, Sheffield and organised by Peak Signal 2 Noise.